If you are curious to know more a figure of Edvard Munch, the Norwegian painter, then you need to visit the Munch Museet. Munch paintings were previously seen at The National Gallery left a very deep impression. As there is a meaning and the message you want to give through Munch’s painting. tourists will be encouraged to get to know and understand more deeply thought Munch. Munch Museet is located in Toyen, Oslo, and not in the middle of town, so needed transportation to get there. Quite up to the T-Bane Toyen or bus number 20 to the Munch Museet. Museum ticket price of 100 NOK or free if you use the Oslo Pass. 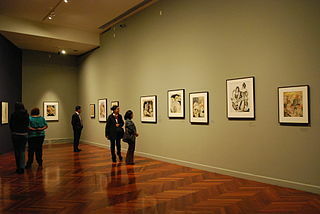 Munch Museet has a collection of as many as 1100 paintings, 4700 drawings and 15,500 prints. Museum security is very tight. After getting admission, visitors must pass through the metal detection gates, while the goods carried examined the conveyor belt. Like at the airport. Security was clearly to keep the museum collection is very valuable, given the fact that the two paintings Munch’s most famous work. The Scream and Madonna had been stolen in 2004. The first room after the entrance of the Munch museum explains the history of life. Edvard Munch was born in 1863. At a very young age, munch have lost a mother in 1868 and beloved sister, Johanne Sophie, in 1877. Munch’s father upbringing pretty harsh, oppressive religious environment, coupled with deteriorating health, makes Munch quite depressed and continues to be haunted by nightmares and terrifying visions. In 1879, Munch entered university with a major in engineering. Munch fall apart lecture due to illness which often interfere with the study by Munch finally decided to leave college and become a painter. In 1881, Munch enrolled at the Royal School of Art and Design of Christiania. During Munch’s early career, a lot of experimenting with style Naturalism and Impressionism, but Munch was not able to express myself through painting Impressionism too deep. From the results of the exploration of feelings and emotions born of a masterpiece painting The Sick Child were inspired by the death of Munch’s sister, Sophie. Painting it raises a lot of harsh criticism from the public and considered immoral. Edvard Munch was one of the first to stream expressionist painter, Munch painting to explore innermost feelings. Theme Munch painting known as The Freeze of Life which explores themes of fear, love, death, and grief. Munch called the Frieze of Life. The majority of Munch paintings The theme of suffering or misery of people around, sometimes even that became Munch painting objects. It was based on a sense of loss over the death Munch loved ones. Seeing every Munch painting like seeing life’s journey. Anxiety, fear, and loss conveyed well through every painting. At the time of Munch’s start depression soluble in alcohol, he painted a self-portrait that was drunk and did not look excited to work or move on. Munch also describes a trip with some romance in the lives of women, famous paintings of the Madonna is said to be a self-portrait of Munch girlfriend. Munch always portray women as innocent, fragile, or even incarnated as a frightening figure. Puberty in the painting, Munch painted a naive teenager who grew up shy posing while sitting on the edge of the bed with a black shadow that hangs on the left side. Meanwhile, through painting Ashes, seen couples get in a fight and looked tired with what they have experienced. Ashes painting is said to be part of Munch’s love story with a woman friend. Munch painting looks more dark and gloomy when he broke up with his girlfriend and started having alcohol dependence. Color painting began predominantly red, blue, and black with an increasingly assertive brushstrokes, describing psychiatric conditions Munch darkening. Munch does look so lost a handle on life after stopping in touch with a lady friend. Munch’s most famous painting is The Scream which looks very abstract and daunting for tourists. Munch painting The most preferred is The Dance of Life. The painting looks very simple and modest with a simple meaning. Women in white on the left side of the painting smiled into place to dance, flower reach hand in front of describing the young phase of life. Woman in the red dress in the middle of the circle and was dancing with a partner to describe someone who is in the main center of life, while women dressed in black with a facial expression that is so bitter as were withdrawn from the dance of life. Themes A Poem about Love, Life, and Death is clearly illustrated by the painting The Dance of Life. Munch Museet museum became one of the favorite tourist destinations for vacation in Oslo. So many things that you will be able to see and learn from there. Travelers who do not understand the painting it can also enjoy all the works of Munch and be fascinated.